Under the heading ‘Living in Space’ and in cooperation with the European Space Agency (ESA) and the German Aerospace Centre (Deutsches Zentrum für Luft- und Raumfahrt – DLR), Techtextil, International Trade Fair for Technical Textiles and Nonwovens, and Texprocess, Leading International Trade Fair for Processing Textile and Flexible Materials (both 9 to 12 May 2017), will illustrate the broad spectrum of applications for technical textiles with examples from the aerospace sector. “Space fascinates people all over the world. All our space missions are backed by many years of research and innovation in which new materials and processing technologies played a decisive role”, says Frank Salzgeber, Head of ESA Technology Transfer Programme Office (TTPO) on the collaboration with Techtextil and Texprocess. “It will take several years before we can hold fairs on Mars. Until then, we will show at Techtextil and Texprocess products and processes covering almost all aspects of human life, from clothing, via building and mobility, to safety, medicine and agricultural technology – in other words, all those fields that are necessary for travel and survival in space”, says Olaf Schmidt, Vice President Textiles and Textile Technologies, Messe Frankfurt. In addition to a space-oriented area in the vicinity of exhibitors for functional apparel textiles in Hall 6.1, insights into the start-up scene and expert lectures are planned. Based on the areas of application for technical textiles, Techtextil will present high-tech textiles and textile processing technologies from and for the space sector revolving around four main themes. ‘Mobility’ brings together examples of applications relating to locomotion in space, e.g., lightweight structures for space capsules and parachute fabrics. ‘Clothing’ covers the subject of functional garment textiles such as space-inspired high-tech fashion. ‘Civilization’ stands for textile products for survival, e.g., geotextiles for growing foodstuffs and textiles for medical applications, as well as for energy production or filtration. ‘Architecture’ presents applications for dwellings and the infrastructure. According to the German Aerospace Industries Association (Bundesverband der Deutschen Luft- und Raumfahrtindustrie – BDLI), the German aerospace industry generates annual revenues of 34.7 billion euros and is set to expand further. With a growth rate of 12 percent a year, aerospace is one of the world’s driving forces for growth in the field of carbon-fibre reinforced plastics. Used in components of space capsules and fuel tanks, this heat and deformation resistant material cuts weight and, therefore, transport costs. Fibre-reinforced composites are also used in the folding antennae of communication, which can be as much as 30 metres in diameter when opened, and earth observation satellites. 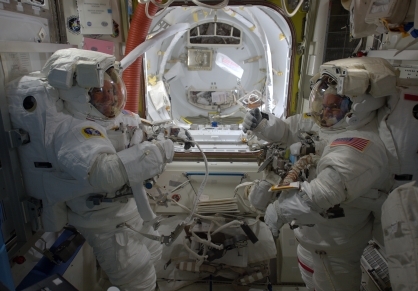 Last but not least, a space suit consists of numerous layers of high-tech textiles that protect the astronaut from heat and radiation at the same time as regulating the body temperature. Journalists will be given an initial preview of the special area at the Techtextil and Texprocess International Press Conference during the Heimtextil fair in Frankfurt am Main on Thursday, 12 January 2017. Satellites have to be assembled in a cleanroom. Therefore, the Cleanzone show which has been organized by Messe Frankfurt since 2012 is also of great interest for the space industry. The International trade fair and congress for cleanroom technology will take place again from 17 to 18 October, 2017 in Frankfurt/Main.